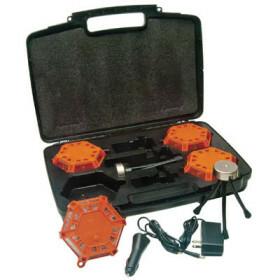 AERVOE LED Super Road Flare Kit (4-Pack w/ Charging Case) » Protective Solutions, Inc. The Super Road Flare 4-Pack Kit includes 4 Super LED Road Flares which are slightly larger than the Classic Road Flares for double the light output and two rows of red LED lights. It does not produce a flame, smoke, or harmful bi-products. Rechargeable batteries so that it is ready for use when needed. Ideal for emergency responders. Available in Red or Yellow.